Eugene Kaspersky's issue isn't so much that Windows Defender exists, but that Microsoft aggressively favors it. With the advent of Windows 10, Microsoft has slowly ramped up the competitiveness of Windows’ built-in software such as browsers (Microsoft Edge), app and game gateways (the Windows Store and Play Anywhere), and security products (Windows Defender). This is leading at least some company leaders to worry that Microsoft is trying to push out third-party software when Microsoft-made solutions are readily available. 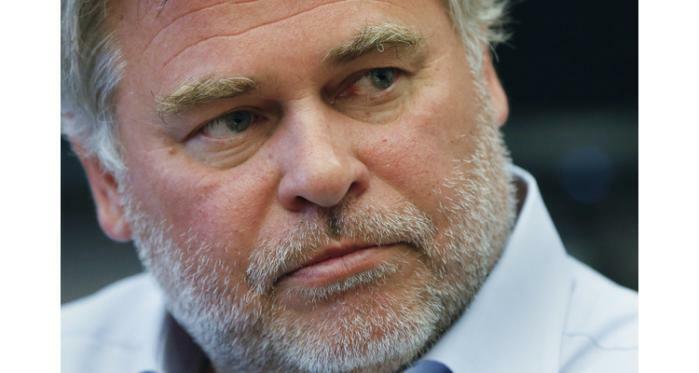 The latest Microsoft competitor to take a stand is Eugene Kaspersky, founder of security company Kaspersky Labs. Recently, Kaspersky announced in a blog post that his company was filing complaints of anticompetitive behavior by Microsoft in “various countries (including the EU and Russia).” It’s not clear if Kaspersky Labs is complaining to officials in the United States. At issue for Kaspersky is Microsoft’s treatment of third-party antivirus solutions that compete with Windows Defender—a free security product included with Windows 10. Microsoft has offered free security software for years. There’s the Windows Security Essentials download for Windows 7, and versions of Defender for Windows 8/8.1 and Windows 10. Kaspersky’s beef isn’t really with the existence of Defender. Rather, it’s with how Defender is favored to the detriment of competing, paid products. The story behind the story: While Kaspersky focuses on security products in his blog post. The context of his argument is that Microsoft is “seizing niche markets” in order to push out independent developers. There’s little doubt Microsoft is promoting its own software inside Windows 10, and aggressively so. We recently reported on Microsoft’s advertisements for Edge on the taskbar even when another browser is designated as the default program. There have also been annoyances with major updates, such as Windows 10 resetting user preferences to Microsoft defaults. Topping Kaspersky’s list of complaints is how Microsoft treated third-party vendors when Windows 10 first rolled out. Kaspersky says developers were only given one week to comply with Windows 10’s new requirements, a timeline that proved impossible to hit. As a result of not being ready in time, Windows 10 would deem noncompliant security programs incompatible and deactivate them. The operating system would then activate Defender in place of the preferred third-party software the user had installed. To remedy this problem, Kaspersky suggests that Microsoft should provide new versions of Windows to developers in “good time” so they can bring their programs into compliance. That’s an odd request to make in the age of the Windows Insider Program, which makes early builds of Windows 10 readily available to the public. That said, even with the Insider program it can be difficult to figure out which late-stage Insider build will be the official version rolling out to users during a major update. Kaspersky also wants Windows 10 to “explicitly inform the user of the presence of incompatible software before upgrading,” and then recommend to install a compatible version of said software after the upgrade. The first part of that demand is not unheard of. In 2012, Microsoft’s Windows 8 upgrade utility informed users of incompatible programs before continuing with the upgrade. Windows 10’s warning for Windows Defender. Kaspersky also took issue with Microsoft’s warning window for Windows Defender. When another AV product is installed, Windows 10 can display the warning you see here that says Defender is turned off. If you press that Turn On button seen above, it automatically turns on Defender and disables the third-party AV program. Kaspersky wasn’t clear about when this warning window appears. When I installed Kaspersky Anti-Virus on Monday the warning window did not appear until I explicitly opened it. Kaspersky argues that Windows 10’s treatment of third-party AV programs can also have some unintended consequences for the user. Let’s say, for example, that a user accidentally installs a trial period antivirus program (it’s easy to do this with bundleware) while also running, say, AVG Antivirus. The new trial software disables AVG, but when the trial period ends for the new software both third-party programs are deactivated, and Defender is turned on. In that situation, Kaspersky believes Windows 10 should default back to AVG instead of Defender since AVG was the more recently used security program. Kaspersky also wants Windows 10 to explicitly ask the user before enabling Windows Defender. That’s probably a no-go since Microsoft aims to balance user convenience and security with ease of use in Windows 10. 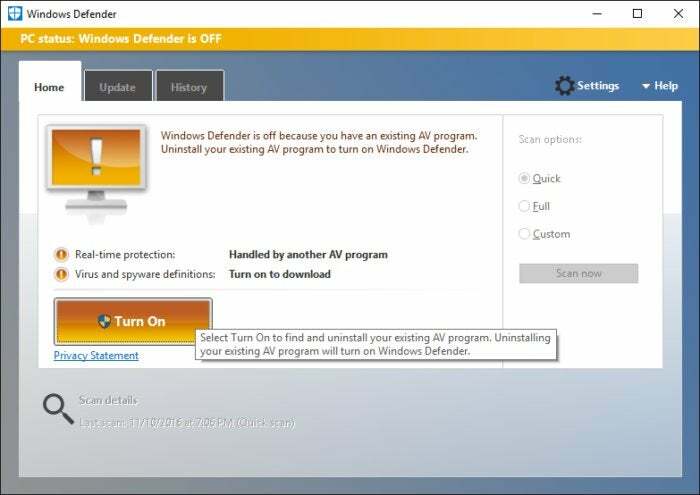 Automatically enabling Windows Defender in the absence of another security program does all of that. A Windows 10 Action Center security warning. Yet Microsoft could make its Action Center notifications more explicit. When I uninstalled Kaspersky AV on Monday, Windows 10 notified me that my PC was not protected. The OS then advised me to click on the notification seen here to activate Windows Defender. Seconds later Windows Defender was activated with no action taken on my part. Kaspersky isn’t the only one taking issue with Microsoft’s current tactics. Epic Games CEO Tim Sweeney has accused Microsoft on several occasions of killing the PC as an open platform—arguments that we’ve disagreed with yet haven’t entirely discounted.